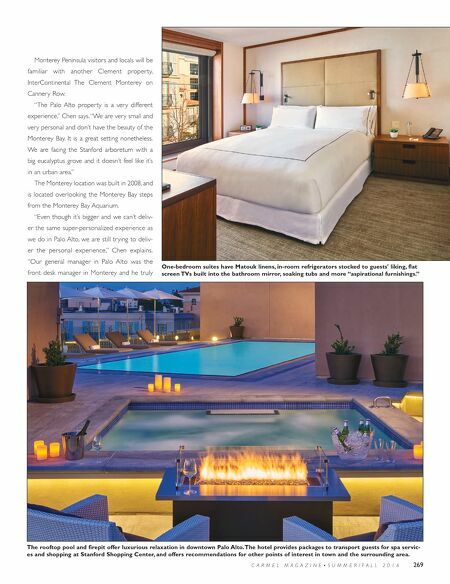 C A R M E L M A G A Z I N E • S U M M E R / F A L L 2 0 1 6 269 One-bedroom suites have Matouk linens, in-room refrigerators stocked to guests' liking, flat screen TVs built into the bathroom mirror, soaking tubs and more "aspirational furnishings." Monterey Peninsula visitors and locals will be familiar with another Clement proper ty, InterContinental The Clement Monterey on Cannery Row. "The Palo Alto property is a very different experience," Chen says. "We are very small and very personal and don't have the beauty of the Monterey Bay. It is a great setting nonetheless. We are facing the Stanford arboretum with a big eucalyptus grove and it doesn't feel like it's in an urban area." The Monterey location was built in 2008, and is located overlooking the Monterey Bay steps from the Monterey Bay Aquarium. "Even though it's bigger and we can't deliv- er the same super-personalized experience as we do in Palo Alto, we are still trying to deliv- er the personal experience," Chen explains. 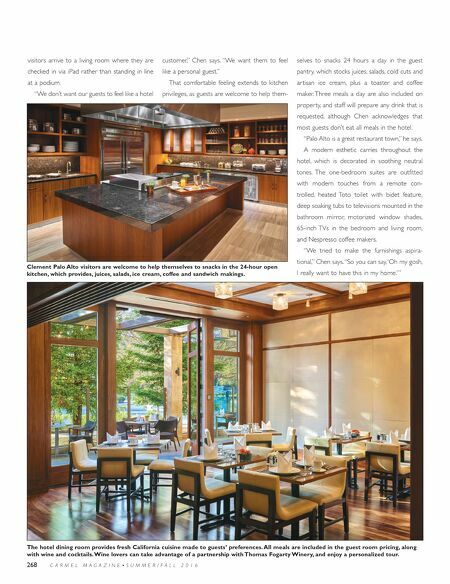 "Our general manager in Palo Alto was the front desk manager in Monterey and he truly The rooftop pool and firepit offer luxurious relaxation in downtown Palo Alto. The hotel provides packages to transport guests for spa servic- es and shopping at Stanford Shopping Center, and offers recommendations for other points of interest in town and the surrounding area.